Halloween Horror Nights at Universal Orlando is just under a month away, and we now have the full line up. 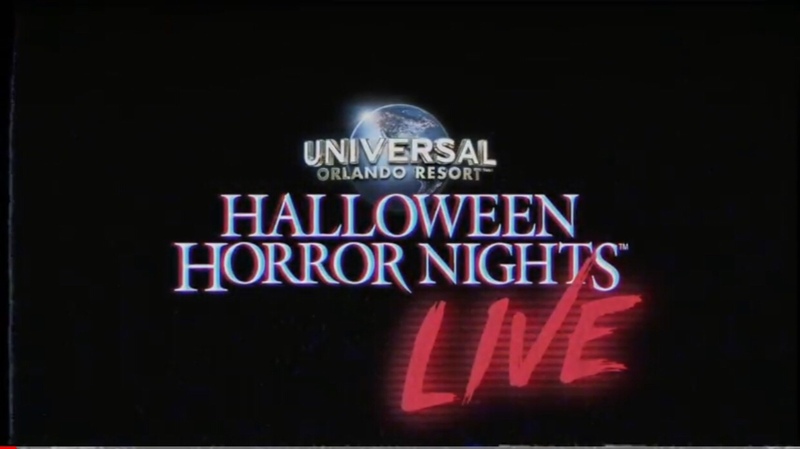 We also have a cool broadcast done by Mike Aiello, Lora Sauls, Patrick Braillard, Charles Grey, Blake Braswell, and David Hughes as well as a few other folks on the creative team at Universal Orlando. The team got together to answer questions, and give more details about HHN 28 and what to expect about the event. The event is over an hour long, and while it’s amazingly fun, that’s a long time. We’ve highlighted the ten big spotlights from the talk that showcases what you need to know for this year’s event. Of course if you want to watch the entire thing, we have it here in the player below. Here are the top ten things we’ve learned from the broadcast about this year’s event. When guests walk into Stranger Things they will be waking into the show itself. While the maze will take you through all of the episodes of the first season, it will be set up like one continuous episode. You’ll see a beginning of the story, the title sequence and then the rest of the story. This year, Stranger Things will be three different Halloween Horror Nights events around the world. Orlando, Hollywood and Singapore will each have their own version of the maze. While they will all be similar, with things like the Demogorgon design and the feel of the maze, each location will have differences that make each one unique. That’s because it’s up to the creative teams at each one to translate the property for what works with their audiences. Poltergeist has so many different scenes that are so amazing, but how do you incorporate that into a maze? The team is taking a few creative liberties and will take you into the house from the film and the maze, by showcasing one of the best scenes from the end of the film. Guests will enter the maze from the pool scene, where coffins pop up out of the ground. They will journey underground and into the kitchen where the rest of the story takes place. Speaking of Poltergeist, the maze will take guests into the light. It was a point of contention in the film, with Carol Anne being told to stay away from the light, then being told to go into the light that the creators at HHN wanted to let guests see what the big deal is. So they will approach the light, and then actually enter. What will we see? We have no idea but, all are welcome, all are welcome. From the Easter eggs in the house, to the films that are played out in the maze itself, Slaughter House Sinema is a mash of different made up movies. The team says that it’s always a risk making the anthology style houses, if you don’t have a good “bonding agent”. Slaughter House Sinema does a great job of sticking it all together by using the Carey, Ohio drive-in theater as the backdrop, and having all the schlocky B-movies as the subjects. The movies are told apart by movie posters between each scene. This is also the first time that HHN has tackled Bigfoot with the Swamp Yetis. The new Killer Klowns scare zone will take all of your favorite parts of the movie and bring them to life using a new area of the park. The area between Transformers and Fast and Furious serve as the backdrop. It’s being used because of the brand new Cinematic Celebration show. That show uses 3D mapping and projections to bring the movies to life. This new zone will feature that same 3D mapping to bring things like the giant big top to life. There will be some take off and landings throughout the night, and they will also have some shadow puppets happening throughout the night. We will also see the popcorn monsters, and cotton candy cocoons. Usually when there’s a doll based house or scare zone, the creative teams take liberty with the size and usually “shrink the audience” to doll size. This year, Chucky will be life sized and will actually be a live puppet, and he will be fully loaded, and true to the film. 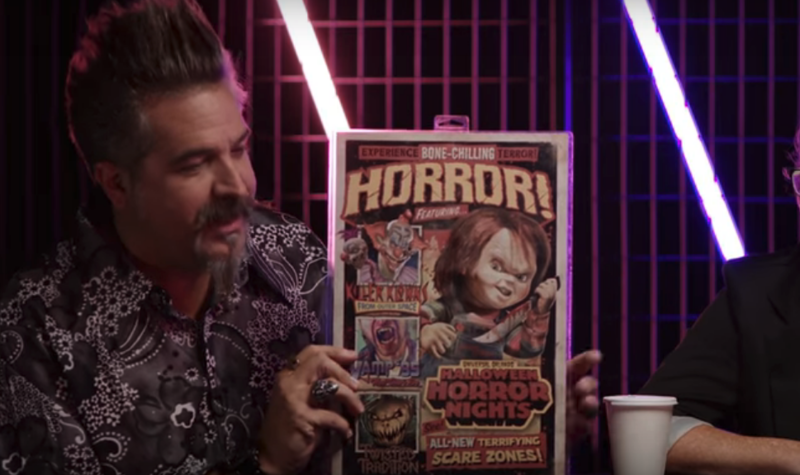 The story will have Chucky invading toy festival where a toy company is celebrating the 30th anniversary of their toy, and they roll out the Chucky dolls as part of it, and he is truly there to corrupt and destroy everything. The scare zone will use toys that are a throw back to toys of the 80’s, and will bring them to life. It will also borrow a little bit from the last movie “Cult of Chucky” where there will be toy workers who pretty much worship Chucky and the cult symbol that he has become. There’s also a nod to the Chucky house from 2009, with tons of props and creatures from that house as well. One of the best things about the original Vamp 55 was the soundtrack. The scare zone was set during the 50’s and had a very playful and fun soundtrack that played along with it, of course set to the sounds of screams. Vamp 85 is set 30 years later, and of course will be full of amazing 80’s tributes and throwbacks. The scare zone will include a TON of music from 1984, as that year had a lot of iconic music. Big hair, wild colors, and every 25 minutes or so will be a countdown to 1985. In fact, there’s no music past December of 1984. This year Halloween Horror Nights is bringing ten huge houses to the event. Ten houses means that team had to find a new place to put that last house, and so Seeds of Destruction will be using a brand new location that is not only new to the event, but new to the park. Seeds of Destruction tells the story of an extinction event, and uses make up and terrifying masks. It will have tons of Easter Eggs and nods to past houses and events. Of course, Jack and Eddie make an appearance, there’s also a nod to Ghost Town: Lightning Gulch. There’s a ton of nods to the past events, and it will be one that will fans will want to go through. Inspire. Create. Destroy. Academy of Villains is by far one of the best acts to come to Halloween Horror Nights in many years. While some may lament the passing of Bill and Ted, it honestly sounds like Academy of Villains is going all out with a show that should amaze. It’s called Cyberpunk, and will definitely have the feel of the 80’s that the rest of the event will have oozing out of it. The Fear Factor Stadium is being fitted with a new stage and props for the show. Academy of Villains showed their dedication in 2017 with three different versions of their show, due to the fact that Hurricane Irma blew down their stage. It was a bad situation for both the park and the group, but they showed everyone just how amazing they are by not only going on, but doing an amazing version with what little they had. The new show is so inspiring that founding member of Academy of Villains, Phoenix will perform. That’s a first for the event. COOL EFFING POSTERS WILL BE SOLD! We collect HHN stuff at BTT. My closet is so full of stuff like shirts, media gifts dolls pins. If it’s HHN stuff, I have it. This year the level of HHN Merchandise looks insane, as there’s mugs, shirts, hats, and leggings from the various houses. We don’t have a full list, but what we’ve seen so far looks awesome. Even more awesome is that there’s posters. So far we’ve only seen one, but it’s amazing looking and has the 80’s movie poster vibe going for it. We are really hoping for the movie posters from Slaughter Sinema, as well as the banners from Scary Tales. Okay, so this wasn’t revealed in the broadcast, but the tenth and final house Scary Tales: Deadly Ever After was. Shortly after, we got the look of the map on the official website. 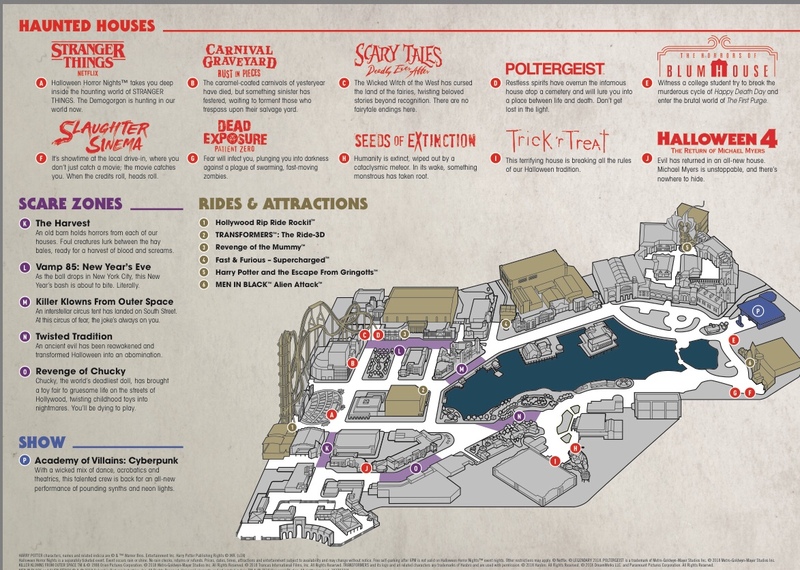 It gives us a look at not only the houses and scare zones, but also a look at what attractions are going to be open as well. You can expect MIB, Rockit, Transformers, Diagon Alley and of course Fast and Furious: Supercharged to be open during the event. Plus there’s two more nights added on, which means that people are going crazy for HHN 28 so far. Stay tuned for more from Halloween Horror Nights, and be sure to get social with us on Facebook, Twitter, and Instagram @BehindThrills for the latest updates!